I try not to write about the Browns. Best to leave that to Tony, Mary Kay and CST's own Senior Writer and Browns beat reporter, Doug. Also there's a legion of orange & brown blogs sprouting commentary on every angle, from next year's draft to this week's matchup. In Cleveland, almost everyone knows something about football. Everyone but the jackasses running our team, it would seem. Because here we go with Rebuild 6.0. The first five varied in size and scope, produced one playoff game, and were led by architects with resumes more substantial than Browns President Joe Banner. To Banner's credit, he knows he hasn't won the benefit of the doubt: "We have to earn (the fans') belief and trust in the decisions we're going to make as a group, " he said. "I don't expect them to trust that until we prove that the trust is well placed. So I understand the skepticism for now." So Joe knows press conferences, I guess. Joe certainly knows economics. Joe even knows his fan base has been abused beyond all recognition for nearly a generation. But does Joe know football? Specifically, quarterbacks? That's why we're stockpiling picks, right? Unlike most Sunday mornings, I'm not armed with an opinion, or even a confession, and I won't be taking sides on the Trent Richardson trade. I'll leave that to Bill Simmons, Bill Barnwell, LeCharles Bentley, and Mike Holmgren (I'm usually not analogy-guy, but this interview is like being critiqued on fire-resistant building materials from the man who burned down your house nine months ago). I'm only here to write what we already know. Serve up some facts with your Lucky Charms and let you draw your own yellow moon conclusions. Now that we understand each other, read on. Joe Banner is a former clothing store owner with a passion for children and philanthropy. His first job in football did not come until age 41. By all accounts, he is an efficiently-ruthless executive; a highly intelligent, cold-hearted negotiator and salary cap expert. Under Banner, the Philadelphia Eagles business model was the envy of the NFL. Coach Andy Reid, however, had final say on all football matters. Banner never scouted, identified quarterbacks, or made draft-day decisions. 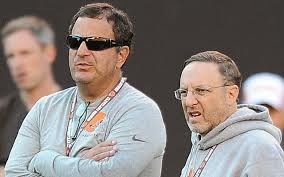 Joe Banner will be selecting the next Browns QB, presumably on May 8, 2014. Mike Lombardi has worked as an NFL executive for four different teams, overseeing personnel departments in Oakland and Cleveland. Lombardi advocated cutting Bernie Kosar, mid-season, in 1993 when the Browns were in first place and back-up QB Vinny Testaverde was injured. From 1992-95, Lombardi made five first round draft picks selecting Tommy Vardell, Steve Everitt, Antonio Langham, Derrick Alexander and Craig Powell. From 1998 to 2007, Lombardi presided over the Raiders drafts with owner Al Davis and picked Derrick Gibson over Drew Brees and Fabian Washington over Aaron Rodgers. JaMarcus Russell was taken with the top pick in 2007 instead of Adrian Peterson or Calvin Johnson. Lombardi was subsequently fired and spent five seasons out of the NFL. He will assist Joe Banner in selecting the next Browns QB. I would normally call this inexperience leading incompetence, but I'm not offering any opinions today. SamVox is not a professional handicapper, but a premier one. He has been gambling his entire adult life and has experienced every sickening turn and nasty twist of fate that occurs during a football season. What distinguishes the Vox is his amazing intuition, astoundingly long memory, attention to detail and preparation, aversion to propaganda and access to the industry's sharpest bettors. He is a two time Pick'Em champion and went 125-109-11 against the spread with his Vox Lox over five seasons for a net profit of over 30 units. His critically-dismissed Vox in the Box column also appears here at CST.